I have a stubborn case of plantar fasciitis for almost a year. I had it several years ago in left foot, and now its in the right foot. I've tried a couple weeks of rest, ice, stretching exercises, and even tried using an Omron TENS, none of which has helped. I don't go barefoot, or wear flip-flops, but I do like my tennis matches a couple times a week, which probably doesn't help the situation. Anybody out there have recent experience with how to get relief? I am seeing my primary doc tomorrow to get a referral to see a Podiatrist and am hoping to get some curative insight from you all. Had the same problem years ago and saw a podiatrist who made custom orthodox inserts which helped to some degree. I ended up ordering some Phase Four orthotics that have been excellent. They do take some getting used to but they did the trick and I highly recommend them. Hope this helps. +1 on the orthotics. I had plantar fasciitis in both feet for a number of years. The only thing that ultimately made it go away was the orthotics. Don't skimp and get the cheapies from the drug store. Get custom made hard plastic and you will notice the change almost immediately. I'm in the same boat, going on about 7 months of my flare up, first real one. I think I might have had it before for a few days, not diagnosed, ignored... now for real. I stopped running for 2 months, got expensive arch support slippers for indoors, orthotics for running shoes. I do wear flip flops being FL, but i hate all the ortho ones, so I slip one of these on my problem foot that helps - and just include this in my "arsenal" of remedies. My PF isn't debilitating at all, I went back to running. The only real bother is early AM and any time I'm truly barefoot which is pretty much nothing now. I went to a good podiatrist, there's nothing really more I can be doing. I had a case after doing a lot of walking during a trip to Italy in May. I ordered two insoles from Amazon on June 13th. One of them came with a small pamphlet with exercise suggestions that was helpful. I believe it was the ProFoot. It was basically standing on the edge of a step, while facing upstairs, with your heels overhanging the tread and letting your heels lower to stretch the muscles and tendons. I still have the ProFoot in my shoes and never used the Scholl's. After a few days the pain began to subside and is totally gone now. I also have had PF that persisted for at least a year. I found that wearing Orthaheel shoes constantly helped, and I still wear only Orthaheel. They have an exceptionally high and rigid arch so provide similar support as orthotics. I buy Orthaheel shoes from E-Bay mostly, but they are also sold online and on QVC. I feel for you....it's the worst pain I have ever had, worse even than when I had a total hip replacement. I don't remember how many years ago but I had a bad case. After many visits to the podiatrist and all kind of stretching and heel cups I ended up with cortisone injections. It wasn't as bad as it sounds and it did help to end the flare up. The stretching was a big part of it, too. 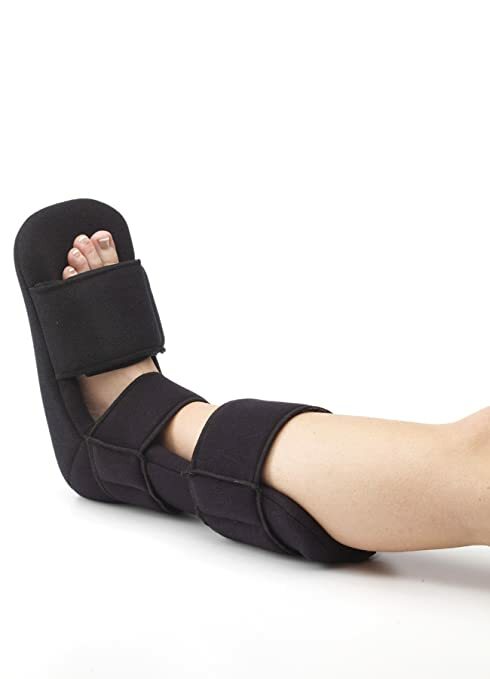 I had the PF for over year, it was really painful and sometimes I just limped all day. I tried arch supports but they just made the tendons hurt more. When I mentioned this to my doctor, he said arch supports don't always work, despite the marketing hype. He demonstrated and recommended 2 simple stretching exercises; one that stretch the calf muscle(s). and one that stretched the Achilles tendon. I performed those each once the first thing in the day. After about a week or so, NO more pain or discomfort. That was about 2 yrs ago, and I still do the routine (about 1 minute) every morning and never have had any discomfort since. YMMV, but it might be worth asking the doc about that. +1 on the injections. It worked fast. After that stretching + orthodontics did the trick. The shot is nothing to fear unless you don't believe in using steroids. I thought about that but the relief won out for me. Much as I hate to get cortisone injections, that's what really helped me (along with ice and stretching). I had it for a while and the drugstore heel inserts worked for me. DW had to go to a podiatrist who recommended a specific specialty shoe store. They had someone study her gait and then recommended a specific shoe. The shoes were not custom made but were pricey, at about $130/pair. Since it worked that made the price worthwhile. I had a bad case of plantar fasciitis about a year ago. I tried everything. Even had a pair of inserts made for myself. Nothing worked until my sister told me to try a pair of shoes, called fitflop shoes. They have casual, dress and tennis shoes. I got one pair (they can run over $100 a pair if not on sale). I no longer had pain. After three months I tried on another pair of shoes and no plantar fasciitis. Now I only wear the fitflop shoes. You can go to fitflop.com and take a look. Just my 2 cents, but it worked for me. Hope you become pain free soon. I was able to resolve mine with a boot like this. I also started doing some exercises that MichaelB posted. They seem to have kept it at bay. I do them on my steps at least once a day. My wife has a different problem on top of her feet--mid foot arthritis. She can barely wear shoes. If you're well insured, go find an orthopedic surgeon that's a foot specialist. Most big dr. groups will have one. They're better equipped to handle the problem than a podiatrist. My wife's physician swears by custom fitted orthodontics--and wearing a specific brand of shoe (if you're female) called Allegra. They' have a hard rounded sole, and are now the only shoe that goes on my wife--and on the doctor's feet too. We've noticed many nurses wearing them too. Our Belks store has a complete Allegra shoe department, so they're very popular. I would think men would have a specific brand of shoe that does better for those with P/F problems. Thanks for all the tips. Looks like some quality orthotics are in my future. A Strassburg sock can also help and may be more comfortable to sleep in than that boot, though the boot is probably more effective. That's interesting... If I ever get PF again - and have travel planned... I'll definitely go this route. More packable. I was really worried that my PF wouldn't resolve before our 9 week trip in 2015. That presented the dillema - haul the huge boot (not good when you're travelling with carry on only.) or deal with daily pain (not good either.). I have my boot - so hopefully I can use it at the first sign of PF - and resolve it quicker. Cortisone and taping every day cured mine.